How many times you've entered a supermarket,spent less than 2-3 minutes to pick up what you needed but had to wait several minutes in billing counter queue because people ahead of you had dozens of items in their carts? What if we could completely eliminate billing counters and let customers walk away with their purchase? That is the future of retail being tested by Amazon (Amazon Go) and other big time giants. The good thing is, same technology is already available in India. I was in Kerala when I read this and I figured out that the store is about 4kms from where I had to return my zoomcar KUV100 car, so it looked possible that I can pay a visit to Watasale Kochi store and experience it myself. Thus last Sunday (yesterday) I reached Gold Souk Mall on the outskirts of Kochi at about 10 AM- Watasale is located in the basement level of this mall, near to Big Bazaar. Google had said Watasale is open 24x7, but the store was locked. A staff in neighboring store said it would open at 10.30, but at 10.45 when we came back after roaming around the mall, we were told Watasale would open at 11 AM. Finally at 11 AM we could go in. There were couple of staff to oversee- it is not totally staff-less operation- probably because there’s a risk that people would jump the barricade and steal things if left unattended. So there were staff to supervise. 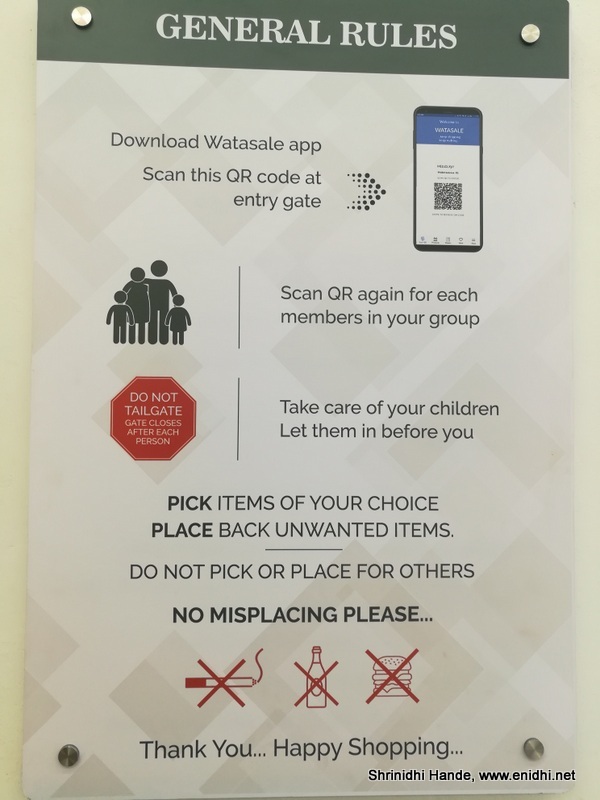 They also had to ensure that all items are where they are supposed to me- misplaced items would confuse the sensors and spoil shopping experience for customers. There is no face recognition yet, though this is mooted as ultimate way of recognizing the customer. 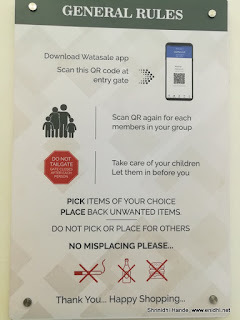 Right now identification happens through scanning the barcode on your mobile app over the entrance gate. Once inside, there were not too many items to choose from- a set of beauty and health care products, few snacks and juices etc. 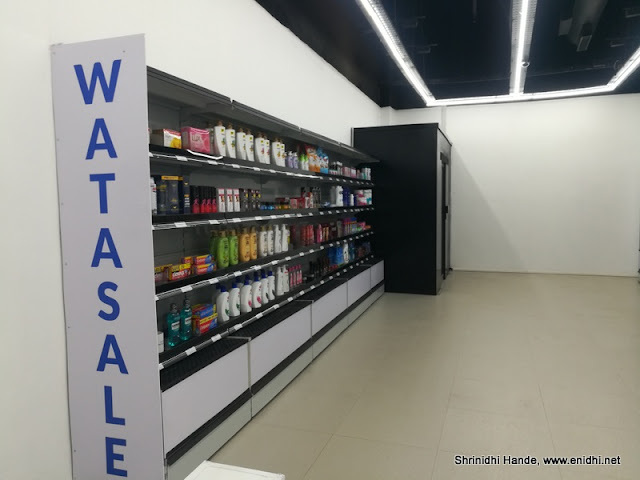 May be only about 50-100 odd items- this is not enough to run a store profitably but I am sure they know it and would expand/increase items once the model kicks-in. 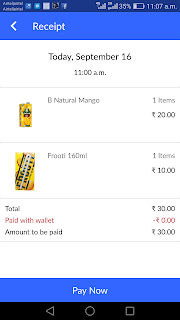 Didn’t want to buy unwanted items, so picked up a maaza tetrapack and another mango juice tetra pack, 2 items totaling Rs 30. Cameras and sensors detect which item is picked up from the shelf and add it to your cart. You can always keep an item back in its position, but you’re not supposed to misplace- like keeping an item in wrong place. Essentially, the billing happens based on the location on the rack from where you picked up your item and what system is fed to have at that spot. So if you or anyone misplaces items, system won’t have a way of knowing. Thus passengers should not misplace items and also better to cross check that the item they are picking is from its original position. Once I am done with my shopping I would walk out. Staff said bill will come in 2-5 mins. He allowed us to go and pay later. Bill got generated about 5 minutes later, I paid via credit card. You can have wallet balance or various other modes of payment for auto debit. The store is very new- opened only August last week, so right now they are just looking to spread awareness and need people to come and try- they are taking a risk that few may not pay- soon I am told some limitations may be enforced to reduce risk- like you should have credit card linked mandatorily else your shopping amount can’t exceed Rs 100 or things like that. I was wondering what will happen if there’re multiple people in the store-this is where technology comes into play. There’re cameras and sensors that can identify each person individually and attach an item lifted from shelf to a specific customer. This way, you won’t be billed for what someone else might have picked up. I was the only customer at the store that time so couldn’t test this aspect, but I believe it works (such a feature is essential- it is not practical to allow only 1 person inside the shop at a time. Staff also gave me a cloths bag for my Rs 30 worth shopping. Other stores charge Rs 3 to 5 for such a bag. Clearly Watasale didn’t make any profit from my shopping, but hopefully this post will help them get more visibility and foot fall. What if I am charged for wrong item or same item twice or if there’s any other dispute? I am sure store owners would have covered most of the possible error scenarios, so there shouldn't be major blunders. We should hope the technology is accurate enough to avoid such mistakes. If there’s a mistake I am sure you can go back and explain to the staff. Understand that this a new technology being introduced first time in India, so there could be some scenarios that aren’t very perfect. Watasale would be happy to learn from your feedback and improve the process/experience over time. Right now they are in launch mode- they just need people to visit the store and get familiar with the concept. The bill took about 5 minutes to generate and the staff allowed me to leave and pay later. I paid later. That is the trust factor they are having on the shoppers right now. I was told soon they will enforce some limitation like only those who have credit card linked can shop, or max value of Rs X if a customer doesn’t have balance in wallet etc. So as of now you may be able to get away without paying- but they have your phone number, CCTV footage etc so can track you down if really required. Why would you like to cheat and get yourself in a spot over a few items? Be sure not to drop things off the shelf- system may not recognize that you’ve not bought an item but just threw it down- you may still be charged. Similarly keep an eye on what kids are doing- if they misplace, drop or pickup random items you will end up paying. How is this different from a vending machine? Vending machines have limited items-like about 5 to 10 and usually small sized items. Watasale is an entire store- a mini supermarket with several items. So it is much bigger than a supermarket plus you can pick up several items one after another and walk away, unlike a vending machine where you can get one item at a time after inserting money. Where exactly is this store in Kochi? 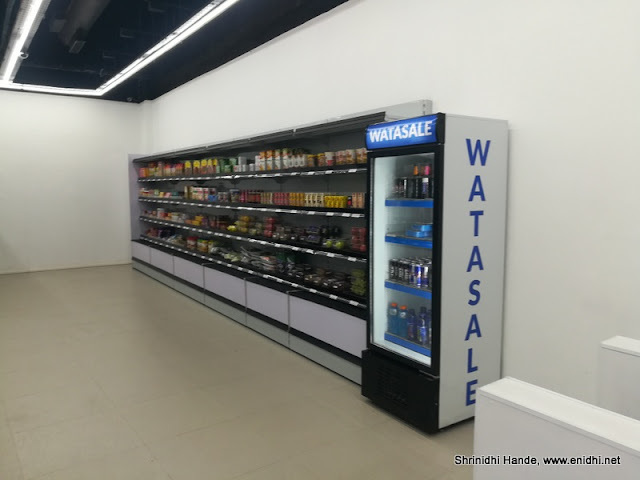 Watasale is located in basement of Gold Souk Grand Mall, Vytilla, in Palarivattom area on the outskirts of Kochi. Not too far from Lulu Mall. 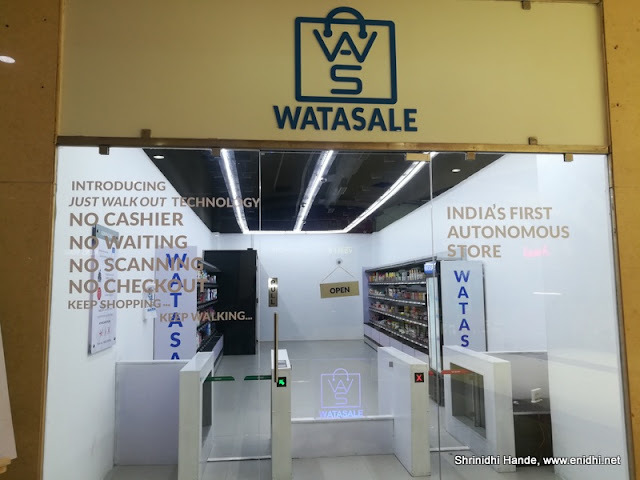 Watasale is looking to open their next shop in Bengaluru. Location and date not known at this moment. No waiting at billing counter- you can come out faster- saves time. On the other hand, more automation, more jobs lost. So what do you think of this concept? Would you go to such stores for your regular weekly shopping? If they main good stock of what customers would need everyday, many will be happy to try. 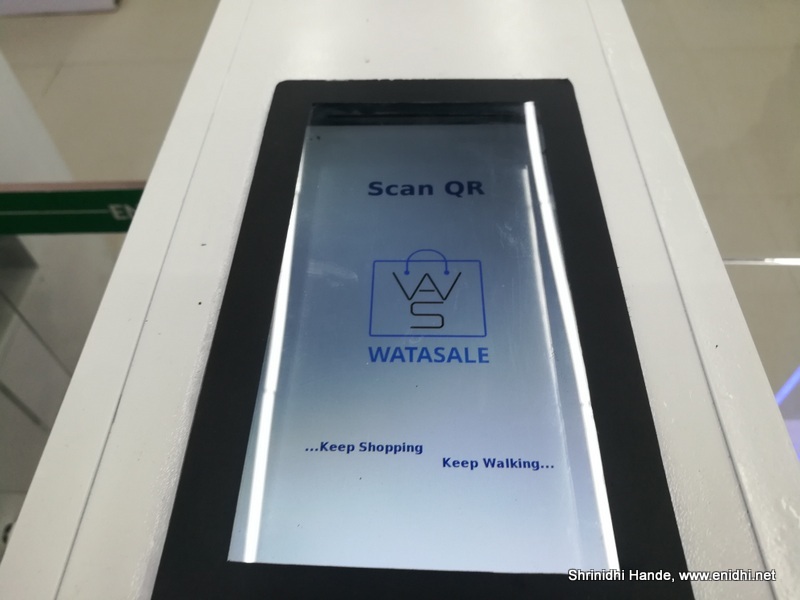 Like you're rushing home and wish to pickup a few items- spending 15 minutes in supermarket billing queue is not worth- you might as well try stores like Watasale. Amazing experience, Nice to read about Watasale. coming of age experience it must have been! How I wish such a hassle free shopping becomes available across all super markets. nice concept but it is yet to be seen how the masses behave or ill behave/vandalize/spill/destroy because that is what a lot of people do.. Yes, security remains a concern- if public were more trustworthy a lot more wonders could have happened. In Japan no one damages public vending machines to steal- everyone pays and takes stuff. But in India we can't risk that. Nice to hear about Watasale -- a model the future supermarket. Looks like the Amazon Go is also very slowly expanding. Shopping is coming of age, in India. Good concept,hope it works well.